Sylvanian Specialty Store, our unique and local Dalby based online store offers FREE DELIVERY in DALBY for orders over $20! We also have a great selection of Houses, Shops and Buildings below. We don't sell these in our online store, as large boxed items cost a fortune to post from Dalby to other parts of Australia! But we can drop these purchased items off to you for free in Dalby! Scroll down the page to see all of our fantastic Dalby only special offers. You'll need to Contact Us to order these! We have over 300 Sylvanian Families items in store (the biggest selection in all of Australia right here in Dalby!) 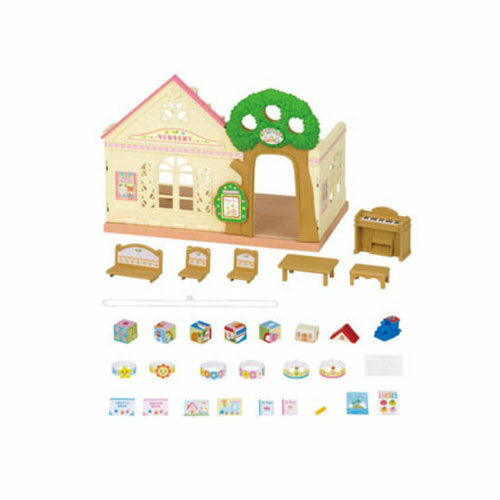 Sylvanian Families Specialty Store is an online store, run from Dalby. We don't have a bricks and mortar store to visit, but you're welcome to browse the online store and choose your favourites! The all new Grocery Market is a fabulous buildings to start your Sylvanian town off. This set comes with plenty of food items, barrels with vegies and fruit to keep the townsfolk healthy, a cute little shopping basket, a food stall and counter and shopping bag. Limited Stock remaining. Offer only valid until stock runs out. The Sylvanian Families Delicious Restaurant is the place to be in Sylvania! Elegant and tasteful, this mint coloured double storied building will fit perfectly into your Sylvanian village. Upstairs is the kitchen, well stocked with appliances and everything a chef will need. Downstairs is the dining room, with and elegant table setting on the terrace. Please note all of the inclusions in this lovely set. There is a chef's uniform, however no figures come with this set. We have many Sylvanian Famlies Figures in store for separate purchase. $85 + Free Delivery locally. Please place orders by using the Contact Us button below. The Elegant Town Series Restaurant is the latest in Sylvania. Comes with so many gorgeous inclusions: even a chef's uniform and the icing on the cake is... well, that gorgeous multi tiered cake. All the kitchen utensils a chef would need and elegant dining furniture and tableware included, as per the above image. Discounted price of $50 only applies to Local Delivery in Dalby QLD 4405. Your Sylvanians can catch the new red Tram from A to B in town! Please note that figures are not included in this set. Discounted price only applies to Local Delivery in Dalby QLD 4405. Right here in Dalby we have the widest range in Australia! *Either send us you order by email or if you wish place your order on line. If you contact us first we'll give you a Free Delivery code to use at checkout. We'll get in touch by email or text message as soon as we can and arrange a suitable time for delivery. Free Delivery in Dalby town area by arrangement. Most deliveries take place either in the morning or between 2 and 3 pm in the afternoon. Or you're welcome to specify a day that suits. If you're not home, you're welcome to designate your work place, an office or some secure drop off point. Please note, there is a minimum purchase of $20 to be eligible for free delivery. No, sorry, we don't have a retail outlet store in Dalby that you can visit. Items are available through browsing our online store only. But if there's anything in particular you're looking for just ask, we're happy to help.